Welcome to a new level of portable low vision magnifying aids! The New Solo HD Electronic Magnifier from NordicEye is the latest high quality portable magnifier from the original leaders in the field. Two minutes is all it should take for a low vision student to set up their vision aid at school and be just as prepared for the day's exercises as their fellow students. Simply take out the table clamp or stand, connect the New Solo HD to the computer with one simple cable and start up. With the Solo electronic magnifier, getting up and running is fast and easy. 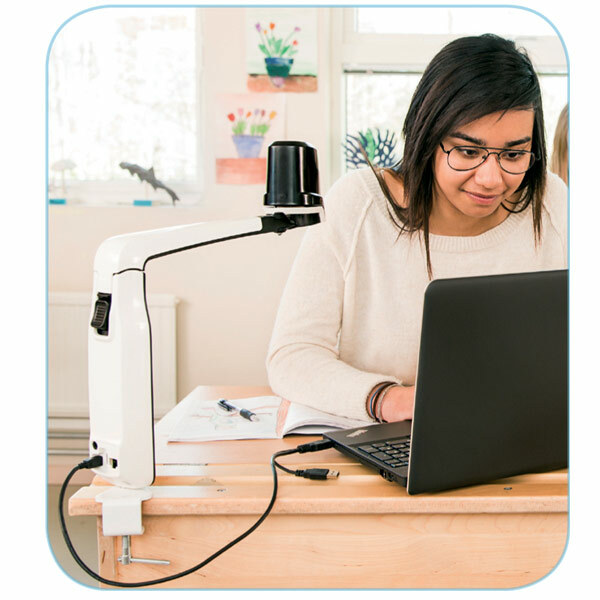 The New NordicEye Solo HD is a camera that makes it possible for people with impaired vision to see text and illustrations magnified on the computer screen. What is unique with Solo is that the same camera can be used for objects at a distance too, for example, what a teacher writes on the board. No extra lighting is required, no mass of cables to get in the way, not even extra muscle to carry it all. Just Solo and a computer. The New Solo is controlled by the wireless remote or by the keyboard on the computer. No wires or control panels are in the user's way. Moreover, the included software allows you to save pictures and movies. The software is also compatible to programs like ZoomText and other similar products. To go from reading mode to distance mode is very fast with the New Solo: Just fold the camera head once! A lightweight low vision magnification solution is of extreme importance when it comes to portable systems. The New NordicEye Solo HD Electronic Magnifier weighs only 2.1 lbs. / 0.95 kg and is easy to carry between home, school and work. The fact that Solo is so light to carry with you and so easy and quick to set up satisfies the conditions needed for this. Need to study in the library? Just collect all the books and periodicals you need, set up Solo and start reading. Group work with fellow students on the agenda? The same thing applies here, whether you're in a cafe or at a friend's home, just set up Solo and go. With superb picture quality the Solo can be powered from both USB 3.0 or USB 2.0 connections, as well as HDMI. That means that the New Solo works out in the same way with both new and old computers. No battery to charge and no power supply to carry around and to connect. The picture quality on the New Solo is simply best in the class! Full HD resolution and a framerate of 60 digital full frames /second ensures an image that is superb also in motion. Less is more, and simplicity is NordicEye's guiding star! New Solo keeps its leading position when it comes to working space which allows the user to use the camera for many different needs.